Most of us walk right by that open Dumpster. But Laurie Frankel points her camera toward the crumpled newspaper and bits of stems, leaves and petals in it, and turns it into art. Who enjoys street litter? 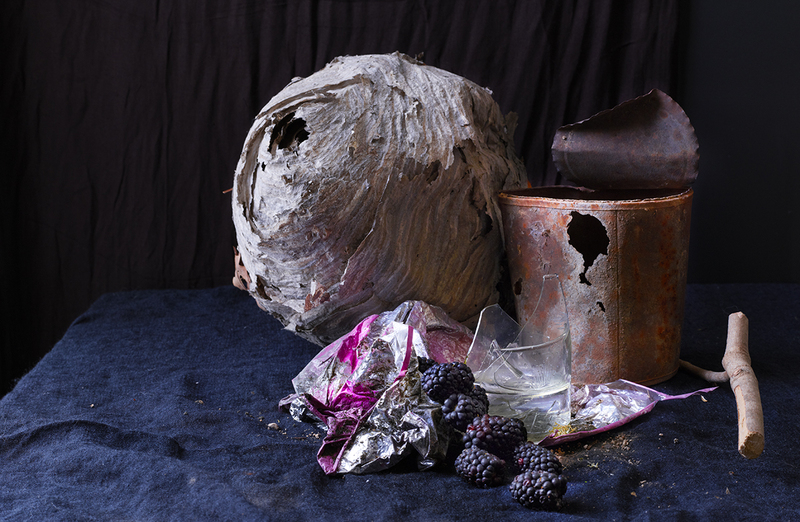 Rusty cans, broken plastic cups and rotten vegetables do, and they gladly pose for her still lifes, reminiscent of the 17th-century Dutch masters. Whether it’s her “Flower Market” and “Recycled Beauty” personal-project series that exalt the discarded, or her commercial photographs of products and interiors, lifestyle and children, Frankel’s carefully composed and lit images express a quiet, yet enthusiastic elegance. Since 2002, Morgan Stanley, Target, Sunbrella, Fresh Cosmetics and Banana Republic, among dozens, have relied on her for images that get straight to the essence and emotion of their brands. It’s no surprise that she won an APA award two years in a row: in Fashion in 2014 and Architecture in 2015. 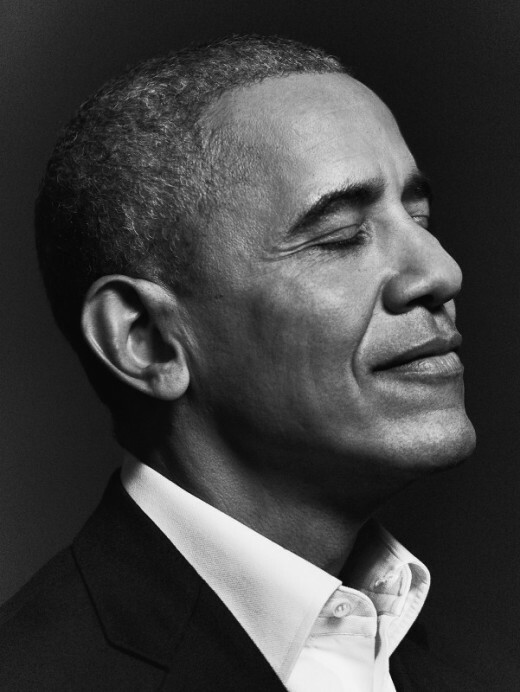 She also has been recognized by Communication Arts, was named by Luerzer’s Archive as one of the 200 Best Ad Photographers Worldwide of 2016 and has received Honorable Mentions over the years from International Photography Awards. You do this with your photography, too, especially in your personal projects that explore the ordinary and the everyday. I’ve always loved and related to the concept of wabi-sabi, seeing the beauty in everyday things. There’s something genuine and real to me about simplicity. No matter what I’m shooting, I want it to be real, authentic and relatable. 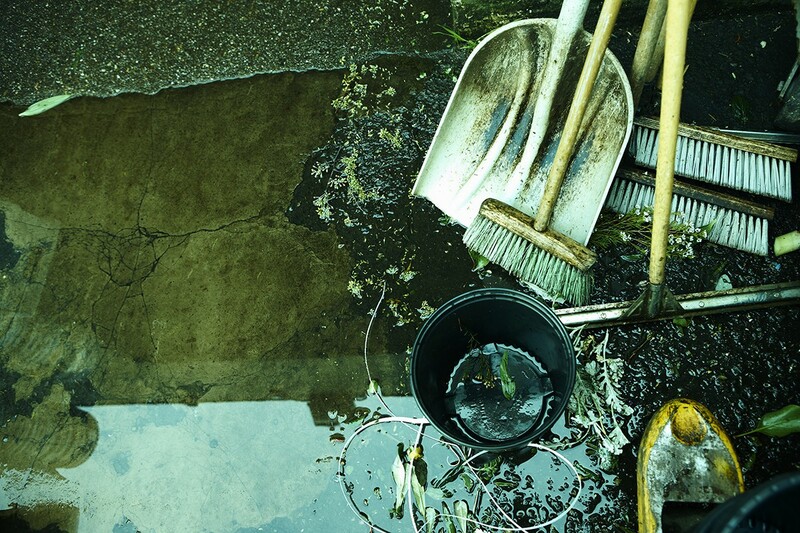 Your images of commonplace objects reveal the beauty of things we normally might pass right by. What matters most to you about this way of taking in the world? I love this question. Did you ever see the movie Playtime by Jacques Tati? It’s all about seeing beauty and wit in surprising and unexpected places. There is so much stimulation all around us, we often miss the subtlety and contrast and beauty. And we don’t see what makes a thing unique. I revere authenticity and love finding the things that make them special. Tell me about one of your latest personal projects. I just finished fourteen months of shooting for the book, Foraged Flora: A Year of Gathering and Arranging Wild Plants and Flowers [Ten Speed Press, October 2016]. I worked on it with writer Sarah Lonsdale and Louesa Roebuck, an artist and floral designer based in California. It was an exciting and challenging project. 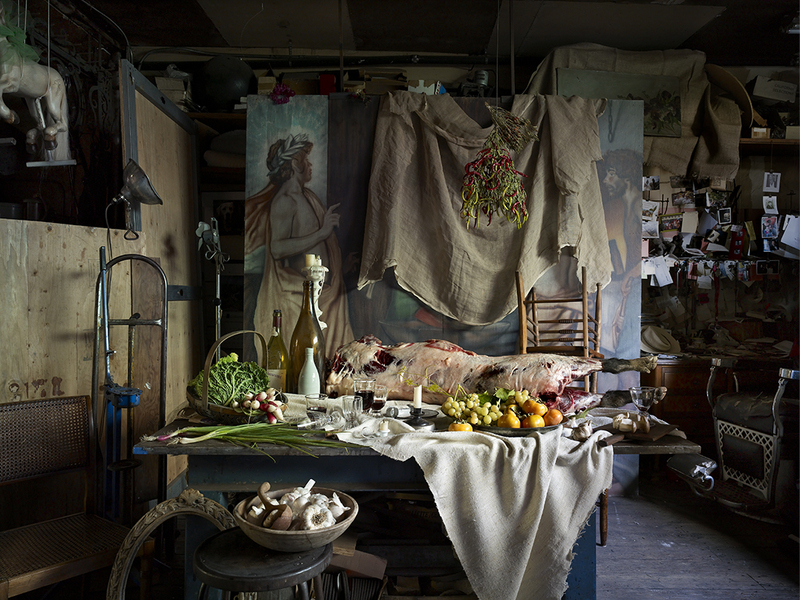 We found unique locations—an industrial barn in a vineyard, a tea merchant’s sprawling hillside home, a high-design office, etc.—where Louesa and Sarah would conceive of concepts specific to the setting, and Louesa would create grand and dramatic installations with the seasonally foraged flora, a different spirit for each month. It was quite the challenge to pull this off during California’s drought. 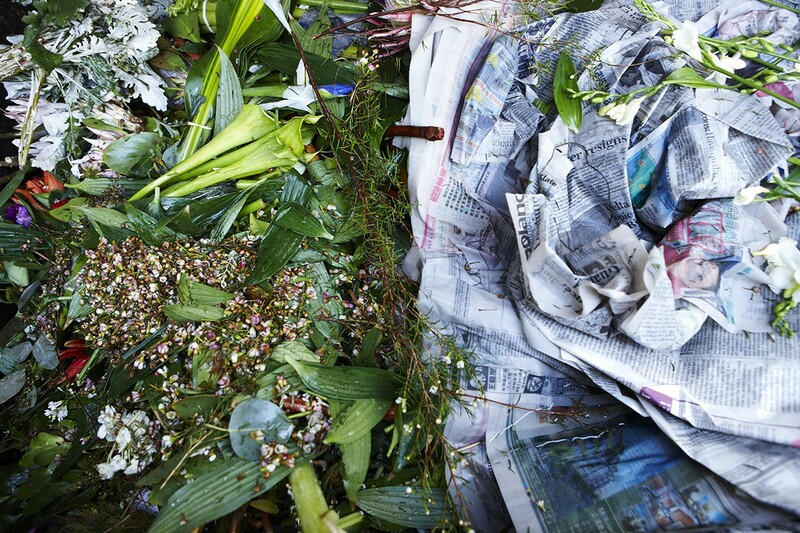 “Recycled Beauty” and “Flower Market” celebrate still lifes. Why are you drawn to this genre? I love shooting people and lifestyle, but still life is a whole different experience. I’ve always loved the control and focus while creating a still life. It’s much like a painter. With painting, you’re mixing paints, stepping back to focus on the composition and playing with color. When photographing still lifes, you take the time to craft the image. You can focus on this one composition, move things around, concentrate on the color and shape the light. I get really focused on light. I obsess on the tiniest aspects of a still life and get into the zone. I love it. There’s a sense of calm I feel, even if there are a million shots to do. What’s the story behind your “Recycled Beauty” series? Back in 1993, just before I. Magnin was bought and closed, I worked as Creative Director there. The head of visual merchandising, Diane Gatterdam, was wonderfully creative and we always wanted to collaborate together on something. One day we were walking down the street and we picked up some garbage, some old packaging paper, plastic wrappers and broken glass. As a joke one of us said, “We should do something with this.” So we brought it back to my house. We found a rotten lemon and really liked the decaying food with the garbage, the plastic wrappers; one quickly decomposes and the other lives on forever. Most people would think these things would be disgusting, but we thought they were beautiful. We got motivated and continued shooting the garbage, both in San Francisco and New York. We’d gather stuff and shoot it together and we never had a plan about the composition or lighting or what the background would be. We’d just get together and start playing with it all. What were you most surprised by with this series? 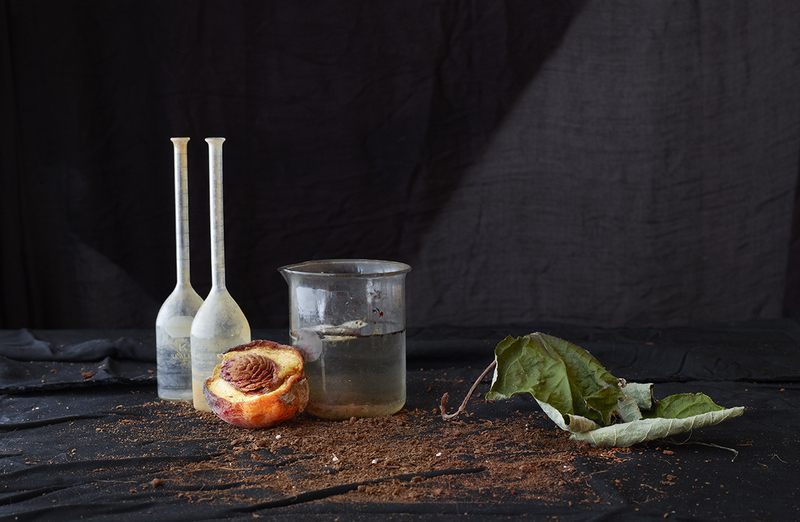 The beauty in contrast was the biggest surprise: old cooked fish and a tuna can lid, a dead bee lying in old milk, the glaze of a rotting peach and of a liquor bottle. What aspects of “Recycled Beauty appear in your “Flower Market” photos? I never really thought about the two of them together until your question. They weren’t meant to be similar. But they do both focus on decay, although the story of “Flower Market” is one of beauty going to waste, left literally on the “cutting room” floor. Another one of your personal projects is photographs of Angelo Garro. What an interesting man—a professional blacksmith and he’s been written up in Bon Appétit. Who is he? How do you know him and why did you want to photograph him? I met him through a food stylist and friend, Robyn Valarik. Robyn wanted to photograph a wild boar he had just hunted, and we ended up photographing many different sides of Angelo. 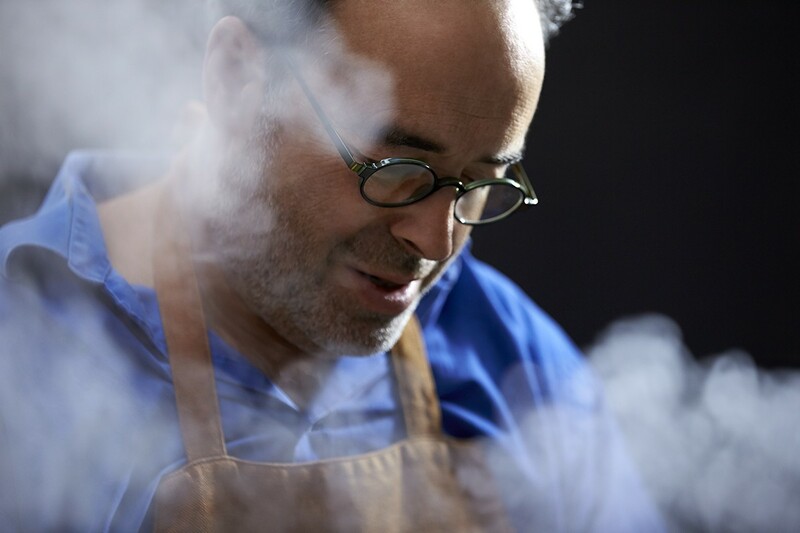 He’s a Sicilian, who has this funky 120-year-old blacksmithing forge right in San Francisco. In the back there’s a small kitchen. He’s an incredible cook and doesn’t stop. He forages his own mushrooms, shoots his own wild boar, makes his own prosciutto, salami, and cheese. And he markets his own organic, seasoned salt and sauces under his Omnivore brand. He’ll invite people to help pick and crush grapes for wine. When the wine’s ready, he cooks for everyone to come over and we help bottle it together. I’m just fascinated by him. He’s an earthy, authentic, old-world man in a technology-crazed, busy city. You rarely meet people like that. I love shooting him. There’s so much depth to him, so many different layers, and I try to capture all these different aspects of what he does. How do you see a body of work like this, and your other personal projects, as similar to your commercial work? When I do a personal project, I’m deeply embedded in it. There’s something that really strikes a chord that makes me want to do it. When I get a commercial project, I dive into it in the same way and try to understand what the company is all about, what their brand is and who they’re talking to. I want to understand it all. I need to prepare for a shoot by thinking about it for a long time and making it a part of me, to bring out the soul of what or whom I’m photographing. I like to dig deep. So, I research and find out as much as I can about the client or product. There’s a distinct Laurie Frankel style in all your photographs, both personal and commercial. What does your own eye tell you about this consistency? I don’t know! I had to ask my reps. One of them, Emily Wynns, says I have “an effortless, feminine, sophisticated but relatable style.” I love having an apparent “effortless” style but, boy, does work go into it! Your clients obviously like your style. How do they find out about you? My reps are rock stars! I love them and they totally get me! They work really hard in sharing my work. We both send out tangible, promotional mailings a few times a year. This past year, I sent out several different images I’d made throughout that time and had them printed as posters on tissue paper. I like the quality of light with that kind of paper. That and the fragility of the paper made the images feel more ephemeral. I think people responded to that immediacy. How do you work with your clients, from initial request to end result? When I get called for a job, I have several conversations with the client’s creative team, talking about the shoot and working on a treatment. I love to collaborate. The team, the clients and I will often share notes and ideas on Pinterest boards. Before we get to a shoot, we flush out the color palette, settings, props and the lighting. Often we’ll experiment with ideas beforehand. All of that collaborative planning ahead of time has two effects. One, everyone is primed with the mission and shared vision; and two, because we are organized, we often have the additional freedom to take advantage of new ideas or serendipitous opportunities. The set is more relaxed. We all have more fun and can be the most creative. How do you and your team all work together? It depends. Often, I work with a lot of the same people. We’ve come to a point where we can intuit each other’s needs and anticipate each other’s actions. We all have each other’s back. That’s great because you never know what’ll come up. For me, it’s really important that everybody be treated in high regard, from the PA [production assistant] to the caterer. Everybody adds so much to the shoot. Working together, the whole becomes much greater than the sum of the parts. So we all encourage everyone to contribute. Plus, I like to have fun with everybody and try to keep things light. What inspires you and how do you keep things fresh for yourself? The diversity in jobs keeps it interesting and working with great people help keep my creative juices flowing. My husband and kids are both nerdy and creative. They give me a different perspective and constantly send me sparks. And I just feel lucky that I love doing what I do, and feel grateful that I get paid to do it. It makes me very happy! What have been some recent, challenging assignments for you? Here are a few from this year: For one project, I had to shoot a runner in a park, but from 80 feet up in cherry picker, well above the tree line. The art director had a very specific arrangement of objects planned. Meeting the layout requirements while planning the shot in the dark, that was fun. Another time, in Belgium, we had to shoot a particular model of train, not moving, but there were none out of service. All were running, and in position at the desired location four times a day, but for literally one second each time. We practiced on other trains in the station, and as a team became fully and automatically synchronized to exploit those one-second opportunities to get the perfect shot, which we did. For another commercial shoot, I had to photograph sailboats from just above water level. Now, I hate the cold and the San Francisco Bay water is freezing (50 degrees Fahrenheit is close enough to freezing for me)! There I was in the Bay, wading chest-deep at dawn to get the shot. It was cold! But, it was also fun. Yes! One time, I had to shoot a lotus field at sunrise. While setting up in the dark, I sunk into the lagoon. I really thought I was sinking in quicksand and held my cameras up high over my head. Luckily, the creative director was a yoga teacher and strong enough to help get me out. It’s so great that you have so much fun photographing. Looking back on your childhood, what do you see then that eventually would lead you to this profession? Growing up in New Jersey, I was always into drawing, sculpting and painting; from kindergarten on, my mother always signed us up for drawing and art classes. She was a stay-at-home mom and also a painter, and I painted with her. And I do remember, in the first grade, getting obsessed with light and how shadows fell on things. And I distinctly remember the chalk dust falling on the chalkboard and the light hitting it. I’d get into this zone and just study light on leaves, dirt, paper or the side of someone’s face. Why did you major in Visual Communications, and why the University of Delaware? In high school I’d hang out after school with a teacher of mine who did freelance graphic design jobs on the side and he told me about the program. My sister went to that university and I heard good things. It was a small program but had a great reputation. I’m still really close to my photography professor from there, Bill Deering. He still teaches there. Whenever I go to New York, he and I try to get together. He was a huge influence in my life and challenged me on so many levels, challenged me to look at things differently. He said, “Don’t do the obvious.” If I did something good, he’d say, “How can it be better? It can always be better.” I think of this all the time! It was a very competitive program, training us for the advertising world. The three main professors worked very hard to make sure we would survive in the big city when we got out there. The “big city” for you was New York. Why there? And how did your career progress? I was already on the East Coast and there was a lot of talent in New York. It was an exciting place to be in the 80s. I started in graphic design because the job I was offered in it paid more than the photography-studio job I was offered at the same time and, as a friend said then, “You’re in Manhattan, now.” I graduated up in my career, from art directing Macy’s fashion-newspaper advertising to senior art-directing at an upscale creative boutique within Revlon to, eventually, working as a creative director with advertising legend (and a wonderful man), Mal MacDougall. He taught me so much about making my point clearly and briefly. Eventually, photography started calling, though. I was freelancing as a graphic designer in San Francisco and when my second son was born, in 1999, and my other son was four, I thought it was time for me to show them that you can pursue your dreams. A couple of design clients, Chronicle Books and Infant Advantage (a high-tech bassinet start-up), gave me opportunities to shoot. That led to getting jobs with Gymboree and Tea Collection, children’s clothing manufacturers. Things kept branching out from there. How has your experience as an art director and creative director helped with your work as a photographer? First, I have experience dealing with their clients—merchants, manufacturers, etc.—and their time pressures. I’ve faced similar challenges and can try to anticipate them in how I do my job. And, of course, I have been intimately involved in combining imagery and marketing messages. That has been part of my DNA as a commercial photographer. What do you feel you still need to explore about photography that might change the way you approach making images? There’s a way of creating images with an important message that can speak to a lot of people and help create change. I’m trying to figure out what those images could be and how I can take my photography and do it for a bigger reason. In thinking things through, about how I can touch people through my photography, I feel there’s got to be way to help people in some other way, but I haven’t quite figured out exactly what those images will be about, and how they are shown, whether it’s the homeless, the hungry, clean water. There are so many possibilities. It’s really important to me, though, and I want to put the time and energy into it, as my next personal project. It’s all brewing, and I feel like I’m getting closer. Copyright 2016 by Claire Sykes. All rights reserved.